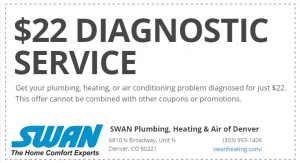 SWAN Plumbing, Heating & Air of Denver offers a complete selection of Denver air conditioner maintenance and tune-up services. Air Conditioning maintenance & tune-up services include a complete 22-point tune up and safety inspection. Or, click here to schedule your air conditioner maintenance service online. What Does Air Conditioner Maintenance & Tune-Up Service Include? While other air conditioning companies charge as much as $189 for the same service, we only charge new customers $49. Regular safety inspections, tune-ups, and air conditioner maintenance is recommended by Xcel Energy to prevent excessive energy usage--saving you money in the long run! We aren't the only ones who believe our air conditioner maintenance service is among the best in Denver; look at what our latest satisfied homeowners have to say about their Denver air conditioner maintenance experience! I could not have asked for a nicer technician to come to my home and spend 2 hours servicing and cleaning my HVAC unit. Zane was professional, friendly and patient with all my questions. He was thorough and I watched him meticulously clean all of the equipment. Fantastic service! I'll be a return customer for sure! Walt and Wally provided excellent service and completed all three of my A.C.'s tune-ups in a timely manner. Thank You. Great service. Very friendly and helpful. Air conditioning tune up was quick. Would recommend. Jeremi was great. Want to see more customer reviews? Check our HVAC & Plumbing Reviews page for reviews from all the best providers like HomeAdvisor, Yelp, BBB, AngiesList and more!